That looks out of this world beautiful! Oh, that sunstone looks like liquid copper! It's gorgeous! I ordered it. please report back when you get it! I couldn't wait to see what you end up picking for metal colors and setting. suzanne2 and Hivona like this. I just spotted these on LT and think they are so beautiful. Wouldn't they make a great Christmas gift...to oneself? chatoyancy, leslie1956, elliefire99 and 3 others like this. This is a freaking bargain people! Being sold by our very own @katharath is a gorgeous 2ct Merelani Mint garnet. With an original purchase price of $2,200, I can not believe she’s letting it go for this price. LightBright, SparkliesLuver, chrono and 8 others like this. I’d be tempted but I’m just a huge oval gal. Awesome color for sure. omg thank goodness I didn't see this earlier! So gorgeous! I had given up on finding an affordable well saturated mint so grabbed this...and very happy that I did. I thought the window might bother me but the color and sparkle distracts my eyes from it. LightBright, MJO, Tekate and 5 others like this. Good work, @lilmosun! You always know how to snag a good deal. Please start a thread when you set this baby! I’m so glad it was you!! We definitely need to see more pics. Any ideas on what you’ll do with it? LightBright, Tekate, MissyBeaucoup and 4 others like this. Ahhhhh this ring is killing me! Oh my, I cannot quite imagine just HOW SPARKLY this one must be in real life. Minty Demantoid trillion picked by Yvonne. kgizo, livannie, leslie1956 and 3 others like this. Omg this emerald halo ring!!! Can someone please buy this and put me out of my misery??? I'm supposed to be banned for a bit. But that size! The color !!!! For those who don't like links, here's a pic. Price is insanely good. kgizo, MissyBeaucoup, strawrose and 4 others like this. I’ve purchased 3 of his gems and love them! I like the designs he chooses and they are very well cut. kgizo, MissyBeaucoup, elle_71125 and 2 others like this. Bahhhhh you aren't helping my weak resolve!!!!! MissyBeaucoup, elle_71125 and Hivona like this. Someone needs to do me a favor and buy this so I don't. 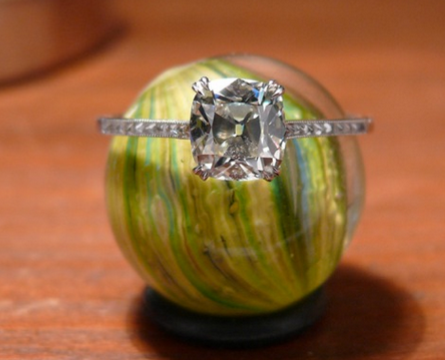 I've seen this ring and fell in love. But I told myself that I need to focus on setting stones I have. I've had it bookmarked since and it's part of Yvonne's 30% one-day sale. kgizo, MidModMin, leslie1956 and 2 others like this. I always thought that ring was so unique and pretty. It’s not my usual style but there’s just something special about it that draws the eye. I can’t believe it hasn’t sold yet. chrono and voce like this. I think it would make a pretty index finger ring. I love the bright color. It’s very eye catching! Sorry, I’m not helping, @lilmosun ! But that size! The color !!!! I’ve been watching this for months, but can’t bring myself to pull the trigger. If someone here bought it, it be excited to see photos! Is anyone looking for hard to find Vanadium Chrysoberyl? Multicolor just added two to their site that are decent sized and look well cut. They are light in color, but I bet that Vanadium mint would pop nicely in a diamond halo. I want the pear so badly, but am on a buying ban . MrsKMB, chroman, leslie1956 and 1 other person like this. FWIW I definitely agree with 2Neezers this pear would be stunning in a diamond halo! Hivona, caf, lovedogs and 1 other person like this. @2Neezers wow what a find! Too bad I maxxed out my bling budget, need to set some gems that I already bought. You *did* mean that the vanadium beryl would definitely pop in a *yellow* diamond halo, right? Because imo that would blow a white diamond halo out of the water in accentuating the minty color. 2Neezers and lovedogs like this. A yellow diamond halo would be gorgeous with a minty stone @voce ! That is another thing to add to my wish list . @marymm I had the pear in my cart all day yesterday too. I asked David for a hand shot of the two stones and he sent it late last night. I think they are a little lighter than what I am looking for, but the cut on heart is really grabbing my attention in the photo. mellowyellowgirl, voce and lovedogs like this.